The next service will be on 5th May and will be taken by Wade Miller-Knight. The following service on 2nd June will be a congregational one, theme to be announced. Services of worship take place at 3pm on the first Sunday of the month at the Friends Meeting House, 150 Church Road, Watford, WD17 4QB. Our services, usually led by Unitarian ministers or lay preachers, include readings from a diverse range of sources, a time for silent reflection and prayer, hymns and music, and an address. Participation and discussion are always encouraged. 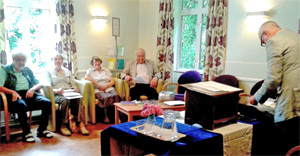 Current members of the congregation are residents of Hertfordshire and surrounding counties. We present joint services during the year when we choose a theme, and are always pleasantly surprised by the creativity of the result. Each service is followed by refreshments, news and chat. All are welcome. See the Links on the left for further information about Unitarianism. If you can't attend a service, look at the UK Unitarian TV Link where you can see an example of a service.